CNY14 // Happy Horse-picious Chinese New Year & Gong Hei Fatt Choi – First time in my life, I don’t get to eat a sumptuous reunion dinner with my family. I am going to miss some of the least seen faces of the distance relatives, the ang baos are either being ignored or being kept in mom’s ‘pocket’ and will miss out tons of gathering, food and a mind out of anything. I am in the UK, an ang mo country, and there’s no such thing as Chinese New Year. I am just so proud of being a Malaysian that I celebrate festivity of multiple ethnicity. Of course, I do miss home, looking at the CNY ads on Youtube, and listening to the CNY songs will some times roll some tears in my eyes, the tear of missing home. But hey, I chose to come here to study for a year, means I’m prepared to experience the CNY away from home. It’s a tough one and I am grateful that I am here for only a year, so the distance of heading back home is not far away. Nevertheless, CNY is still ON for me, reunion dinner is off but a big feast with Malaysian is on! A visit to London’s Chinese New Year’s festival is also on and of course, the tune of CNY songs will be blasting out my speakers throughout the 15 days of the celebration in my dorm room. Dong dong qiang! 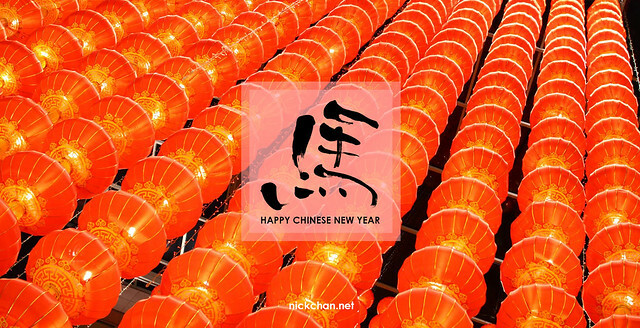 Happy Chinese New Year to all of you. Stay healthy, stay wealthy, and have a horse-picious Chinese New Year!